You are driving down the road hauling horses in your twin axle horse trailer. Suddenly your horse trailer tire goes flat. We have all faced this situation if we haul horses. There is an easy way to solve this problem without unloading your horses on the highway, endangering you and your livestock. You also don’t have to fight an uncooperative jack. 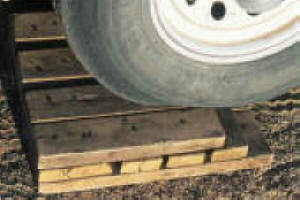 Cut some boards in lengths, using the guidelines below, nail together and you have a great tire changer aid. To use it, set your portable tire changer pad ahead or behind the tire that is not flat. Loosen the lug bolts on the flat tire so they are not tight, then back your rig up or drive it forward to place the good tire on the wooden pad. 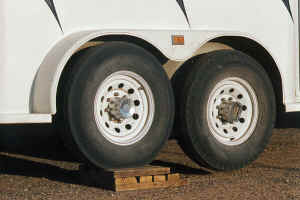 Block the wheels on the opposite side of the trailer. Remove your flat tire, replace with spare, unblock the opposite wheels, and drive off the pad a few feet to finish tightening your lug bolts. You can also use this wooden tire changer pad to place under the trailer drop leg step on your gooseneck horse trailer, or the hitch support wheel on a bumper pull trailer, when you unhook the trailer from your pickup. When ground conditions are soft or wet, this keeps your trailer support leg from sinking into the ground. You can also use the tire changer pad to help change tires on dually pickups and RV's. 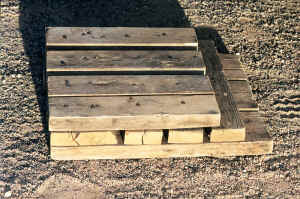 This homemade pad has the advantages of being fast and inexpensive to make at home and can serve dual duty as a hitch leg pad or even a door step. The pad shown in the pictures was made from scrap lumber. The base is three pieces of 2"x6" lumber, 25" long. The middle layer is four 2"x4" pieces 17" long laid crosswise of the base, and the top layer is four 2"x4" pieces 16" long, laid crosswise of the middle layer (the same direction as the base layer). The sizes of the wooden pieces can be adjusted to your particular needs or the availability of lumber.